I use Alfred instead of spotlight but sometimes I accidentally press cmd + space( Spotlight Shortcut ) instead of double shift( Alfred Shortcut ). I want to disable Spotlight( shortcut + not run it in background as well ) so might not open it. Also, does Alfred use spotlight file indexing if yes then I might not want to disable that but if no I would like to disable that as well. In the "System Preferences" app select "Spotlight" from the top row. 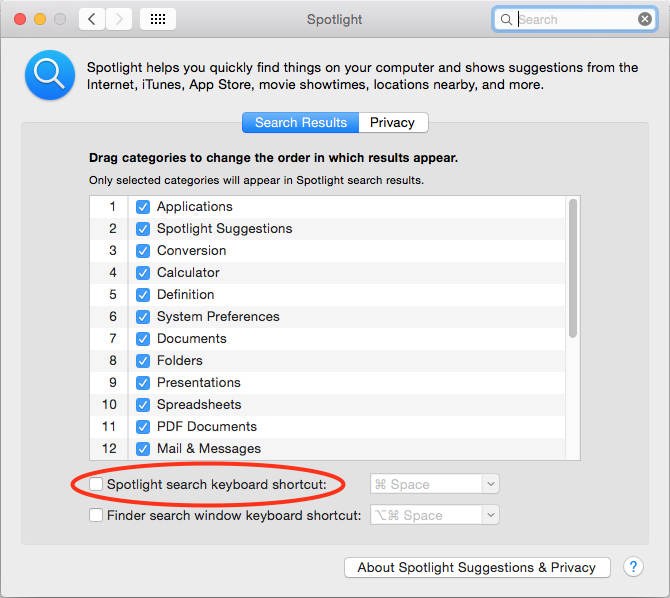 Now, uncheck the box titled "Spotlight search keyboard shortcut:"
I set the Alfred keyboard shortcut to Command-Space, which works a bit like Alfred on stock Yosemite machines. If you want to keep the ability to search Spotlight with a keyboard shortcut, you could also change the shortcut using the popup menu to the right of the checkbox. Not the answer you're looking for? Browse other questions tagged spotlight alfred indexing . Is there a way to disable the Spotlight hot keys via the terminal? How can I make spotlight ignore certain file types and directories? How do I disable Spotlight? How to open a searched file in Finder? How to switch from Spotlight to Alfred via Terminal? why do I have to double tap command + space to open spotlight?